Star Wars: The Old Republic is getting a new expansion this year and it’s called Onslaught, and it will be free to all subscribers of the MMORPG. It’s been three years since the last expansion, and based on this blog post by BioWare, this new batch of content will include a brand new story, two new planets to explore, a new Flashpoint, a new Operation (PVE raid), and new abilities, You also get a new playable special called the Nautolans, which you can see how they look below. Onslaught puts players “at the center of the reignited war between the Galactic Republic and the Sith Empire.“. You’ll explore the “untamed jungles and savage beasts” found in Onderon, and visit the "den of smugglers, pirates, mercenaries, traders, and refugees" in Mek-Sha. And the Onslaught storyline is said to conclude in the new Flashpoint set in a new area of Corellia. The new Operation, on the other hand will be in Dxun, one of Onderon’s largest moons, and will be available at launch. With Onslaught, the game’s level cap will increase to 75, with each advanced class earning a new ability as they progress to the new cap. The #SWTOR Community Cantina will be starting soon! Unable to attend? Stay tuned as we will be live tweeting updates from the Cantina stage with @musco and @Charles_Boyd. We weren’t given an exact date, but Star wars: The Old Republic: Onslaught is set to release in September 2019. 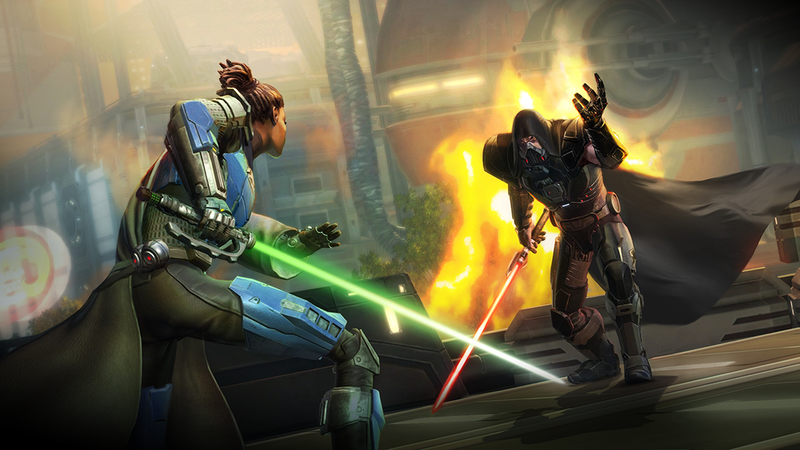 Star Wars: The Old Republic’s next expansion wasn’t the only Star Wars reveal. During the weekend, Respawn Entertainment revealed our first look at Star Wars Jedi: Fallen Order. Respawn’s Vince Zampella also confirmed today that Fallen Order is a single-player experience with no multiplayer, and best of all - no microtransactions. Avellone is something of a low-key star – an independent narrative designer and writer who wrote and directed Knights of the Old Republic II – The Sith Lords, one of the most critically celebrated Star Wars games ever made. More Solo: A Star Wars Story inspired content is scheduled to come out in June and DICE said that it is "going to be quite... Legendary." The sequel from Obsidian Entertainment, subtitled The Sith Lords, was famous for its edgy, subversive take on The Force. But what if Bioware did the sequel instead? "You probably don't want Darth Vader in pink." That's what Electronic Arts CFO Blake Jorgensen had to say about how canon played a role in why cosmetic microtransactions aren't part of the overall monetization plans for Star Wars Battlefront II. It's a positive turn of events, but concerns remain, especially when EA and DICE are confidently declaring that microtransactions will return "at a later date." The loot crate system feels oddly familar. E3 2016 is here! To start off the series of press conference that will be going on before the doors open, Electronic Arts shows the world what they have in store for the rest of 2016 and beyond. Here's a quick rundown.